In Ende, East Nusa Tenggara, there is the three colored Lake at the top of Mount Kelimutu. The lake water color changes from time to time. 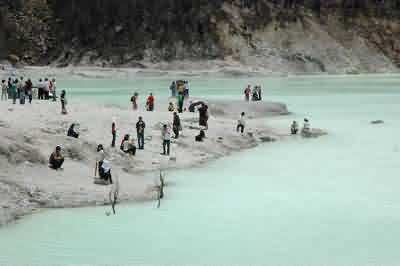 A similar phenomenon occurred in the White Crater in Bandung, West Java. With the same cause, the changes of the mineral content in it. That also depends on weather and natural conditions in the area sourround it. Based on geological history, the White crater formed as a result of the eruption of Mount Patuha in the tenth century. The eruption throws the mountain peak and turn it into a crater, which is now known as White Crater. Thus, the white crater located exactly on Mount Patuha peak with an altitude of about 2300 meters above sea level. Like mountains tourist attraction, the white crater offers cool air, ranging from 5-20 degrees Celsius. It needs a little struggling to reach the location, you’ll need to climb the winding mountain slopes, but that’s precisely the challenge for tourists who love some adventures. Once you arrived on the crater lip, it’s all worth the struggling. Generally, a crater is surrounded by a sandy beach or grassy. But the white crater isn’t. One hectare area surrounds the crater is white pebbles. It is said that the name White Crater came from the color of gravel surrounding the crater. The color of the water on the crater surface is not always white. Sulfur water that fills the crater lake changes in accordance with the levels of mineral content in it. One moment it can be green apple, at other times it looks like a blue sky. In fact, at certain moments it turned dark brown. The exoticism of white crater also added with the rising smoke from the surface of the lake. Around the lake, visitors can find big holes with a depth of about five meters. The smell of sulfur sometimes spread from those holes. The hole were previously the location of sulfur mining. White crater has a width of about six hectares. Lack of infrastructure and supporting facilities are the cause of the rarity of tourists there, even the domestic ones. There are no accommodation facilities for tourists who want to stay and linger to enjoy the exotic sights White Crater. Even to set up a tent seems to be rather difficult. There are only three bathrooms and two musala as facilities for visitors. 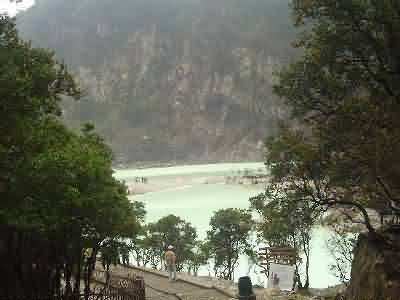 But overall, white crater is a nice place if you plan to go there just for sightseeing or relaxing your mind.